Clip on earrings are now available at Arte Designs. I can convert most of our handmade earrings into non-pierced clip earrings, with exception to our solid hoop styles. These ear clips are available in sterling silver or nickel plated. Clip On Earrings - Just shop for your favorite Arte Designs earrings then choose a clip earring in sterling silver or nickel plated and I'll convert them for you at no extra charge. 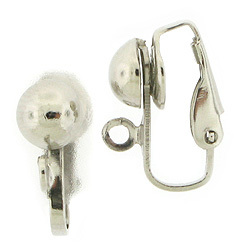 I can convert all pierced earrings with a fishhook, leverback, or ball post. You may also purchase the clip ons "As Is" and convert them yourself. *Please Note: How well a clip on earring stays on your ears varies greatly depending on the thickness of your earlobes. 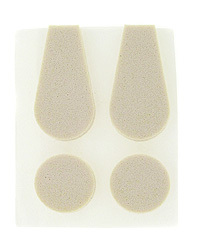 Arte Designs is not responsible for earrings that are lost or damaged as a result of the clip-on sliding off your ear. 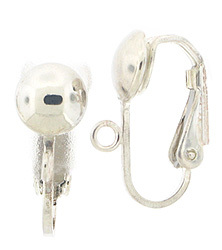 Clip On Earrings for Unpierced Ears.